If you’re new to smart home technology, consider signing up for an If This Then That (IFTTT) account to create custom automations. With an IFTTT account, you can make personal rules for your smart home devices like, “Turn on the lights when my smartphone connects to my WiFi network after work." If you're a new parent, chances are you've felt overwhelmed from time to time -- caring for an infant is a full-time job, and between diapers, naps, and feeding, it can be nearly impossible to make time for your daily life and responsibilities. Thankfully, the smart home industry has been hard at work developing new technologies to make life easier for new moms and dads, so you can now automate routine tasks, or manage them from your smartphone. If you're a new parent looking for tech to bring your sanity back, or if you're a veteran parent interested in building out a smart home, there are a lot of new tech innovations to get excited about. Here are our favorites for keeping babies comfortable and happy -- and keeping mom and dad sane. Security cameras and Nanny Cams are nothing new, but smart technology brings some critical innovations to the table. With smart cameras, you can access the video feed on your smartphone, even when you're not connected to your home WiFi. Some models even have an intercom feature, so you can talk to people in the room, even if you're not there -- just be sure to tell the babysitter ahead of time, so they don't get freaked out hearing voices in the house. The Wyze indoor camera is one of the most powerful and flexible smart cameras available -- and it's a fraction of the price of the nearest competitor. If you're technically inclined, it's possible to run custom software to get even more out of the Wyze, but out of the box it's an incredible value. Our favorite part: Unlike most smart cameras, the Wyze indoor camera can pan, tilt, or zoom, so you can cover a lot more square footage with a single camera. 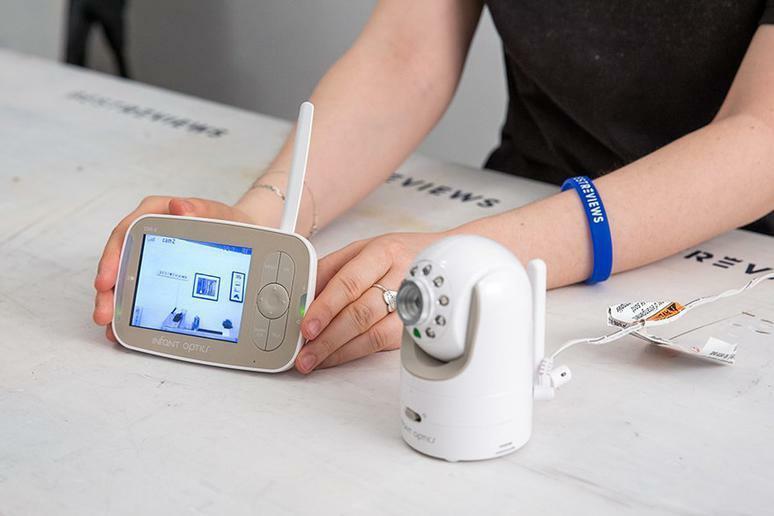 The WiFi Nanny Cam is a modern take on the classic device for making sure your child care professional is taking good care of your kid. With a smart Nanny Cam, you can get notified the minute motion is detected, or simply connect from your phone to see what it sees. Depending on the time of year and where you live, keeping your infant's bedroom a comfortable temperature may be an ongoing challenge. Whether you need to keep the house cool over the summer, warm in the winter, or simply just a moderate temperature all the time, there are two smart devices you'll want to grab. The Nest thermostat is the best smart thermostat on the market. It develops heating and cooling schedules based on your usage patterns, allows you to set custom temperature schedules as needed, and it'll even accept voice commands from Amazon's smart assistant, Alexa. With a Nest, it's easy to keep babies comfortable, so they can sleep longer -- and for parents of a newborn, there's nothing more valuable than a few extra minutes of nap time. Nest's remote sensor is an essential accessory for the Nest thermostat. With a Nest remote sensor, you can place it in any room, and it will send temperature data back to the Nest so it can make any necessary adjustments. If the temperature in your baby's room fluctuates, or if you just want to make sure it stays the same temperature as the rest of the house, be sure to use a Nest remote sensor in their room. Nothing is more precious to new parents than sleep, so it pays to invest in tech solutions that will help your baby stay asleep for as long as possible. Here are the smart home solutions that are revolutionizing naptime. A smart white noise machine is so useful, hospitals should start providing them to new parents. With the Cloud B Sleep Sheep, you can play your baby soothing noises or music as they fall asleep -- and the built-in sensor will automatically pause playback once it determines your baby is asleep. Even better, if your baby starts to fuss or show signs of waking up, the Sleep Sheep will automatically start up again, helping your child fall back asleep. If your baby uses a night light, a smart plug can ensure that it turns off at specific times, to help save energy, and to darken the room for more peaceful sleep once your baby has nodded off. TP-Link's Kasa Smart WiFi plug is perfect for the job -- it's easy to control from your smartphone, has built-in safety features, and works perfectly with any night light. Jaime is a writer for BestReviews. BestReviews is a product review company with a singular mission: to help simplify your purchasing decisions and save you time and money. BestReviews never accepts free products from manufacturers and purchases every product it reviews with its own funds.